Custom cabinetry, artistically designed and installed. Refacing a kitchen keeps the frame of the existing cabinets, but provides all new doors and drawer fronts to give a fresh new look for a fraction of replacing with all new cabinets. It can be a very effective solution. Your cabinets could be structurally sound but just look outdated. Refacing gives them an instant face lift. 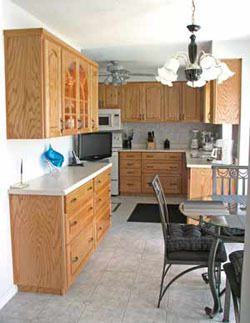 Let us assess the existing cabinets to see if that is a good option for you. REPLACE your kitchen cabinetry and countertops. Custom built, with artistic design and professional installation. Just the way you want your dream kitchen to look and function. What are your creative possibilities? l. You need a good kitchen design. 2. You want to make your kitchen more workable, convenient and comfortable. 3. You know paint will not cure a badly designed kitchen or old sagging cabinets. Ask us to share our expertise with you to combine our ideas and make your kitchen space the very best it can be! COMBINE REFACE & REPLACE to match. In some cases, this is a valid and money-saving option that results in a beautiful finished look.